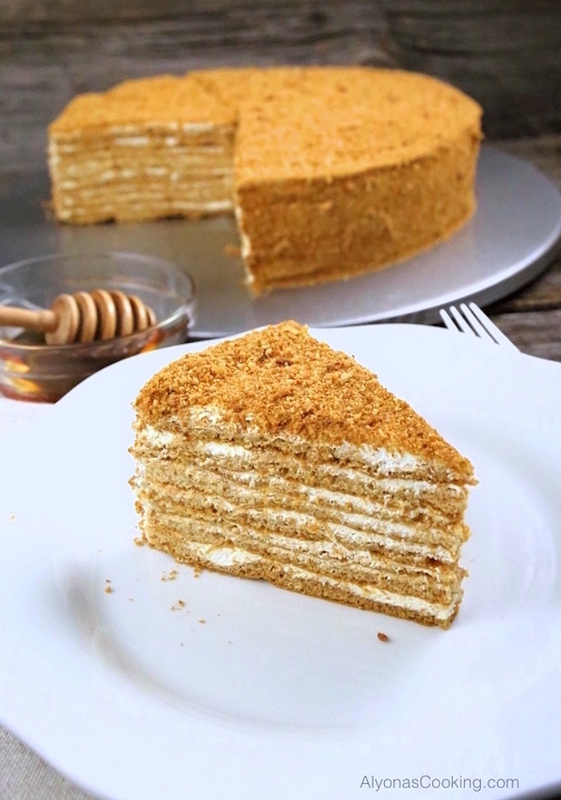 Our local Russian Store sells these amazingly soft, spongey and thin cake layers that make for one of the most delicious honey cake sold in the area, known as the Medovik. 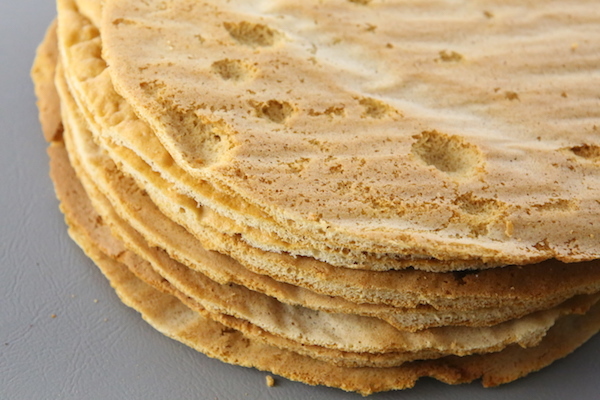 After evaluating the store version, I realized the layers looked spongy and airy, nothing near to the commonly known stove-top recipes that can come out hard and require a lot of rolling. I came to the conclusion that the recipe must be easy if they are made and sold in quantities by a local baker. And it has come out so close, if not the exact recipe! 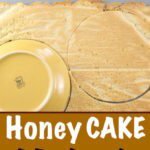 You have got to try this airy and delicious honey cake! 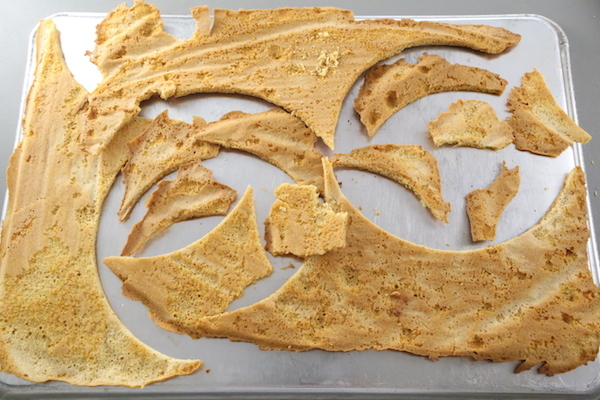 PREP: Pre-heat the oven to 350 degrees F. Then, cut out 4 pieces of parchment paper on inverted 18″ by 13″ baking sheet. 2. 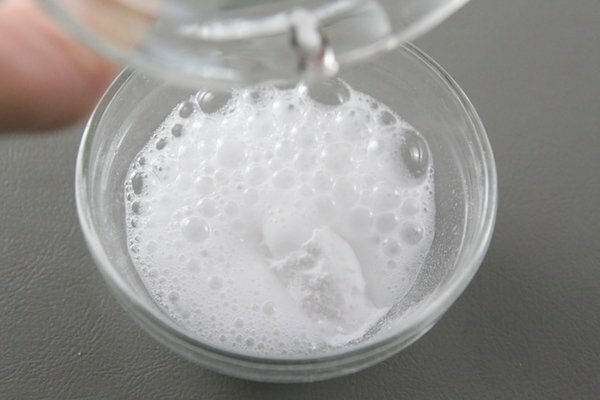 Dissolve the baking soda in vinegar and add to the egg mixture, along with the flour. 3. Beat all together just until combined. 4. 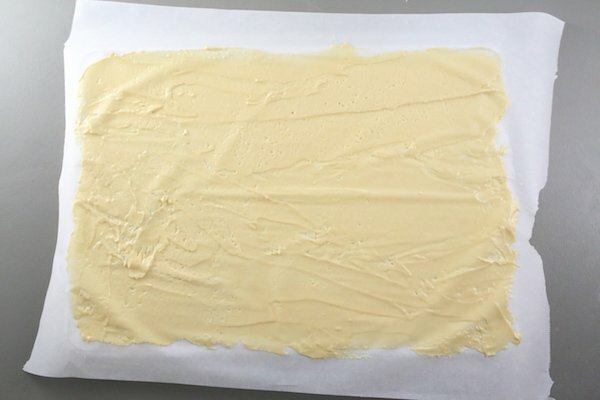 Place about 1/2 cup of batter onto an inverted baking sheet covered with parchment paper. 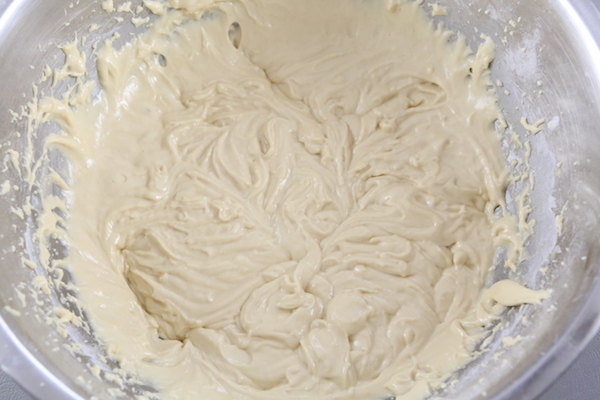 Spread the mixture as thin as possible reaching the corners of the baking sheet and then bake for 7 minutes (batter should be spread out to the size of a 16″ by 11-inch rectangle.) Repeat with remaining layers. 5. 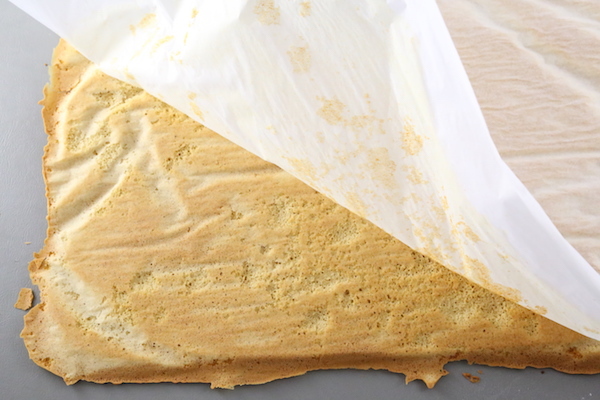 Carefully peel off the parchment paper from the cake layers. 6. 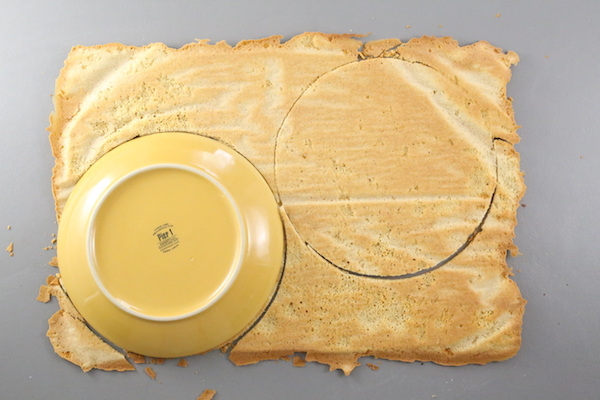 Cut out 2 circles from each cake layer using a plate (about 7 1/2″ in diameter.) You should have a total of 8 circles. 8. 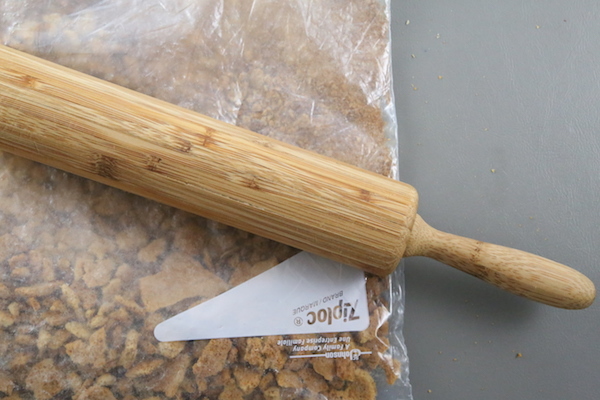 Place dried left-overs into a zip-lock bag and crush into fine crumbs using a rolling pin. Whisk together 1/4 cup sugar and 1/2 cup hot water, until granules dissolve. Lightly brush each cake layer with the syrup. 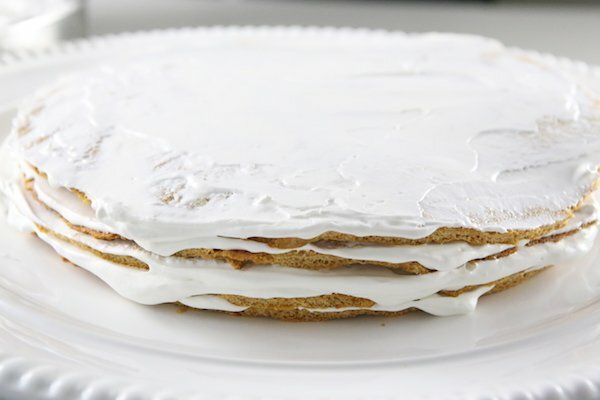 Mix together the cool whip, sour cream, and condensed milk. Place an inverted cake layer onto a cake plate. Spread some cream over each layer and then frost the sides and top. 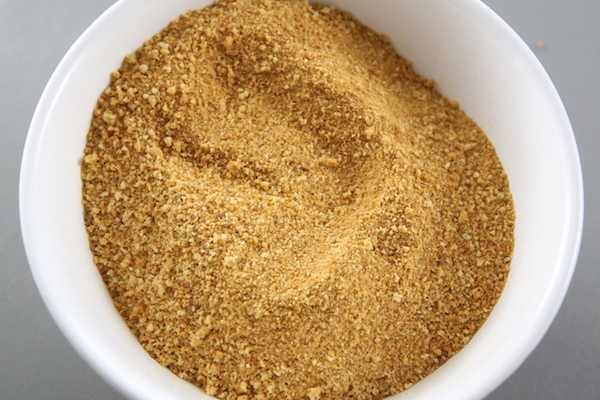 Generously dust the sides and top with the cake crumbs and refrigerate overnight. 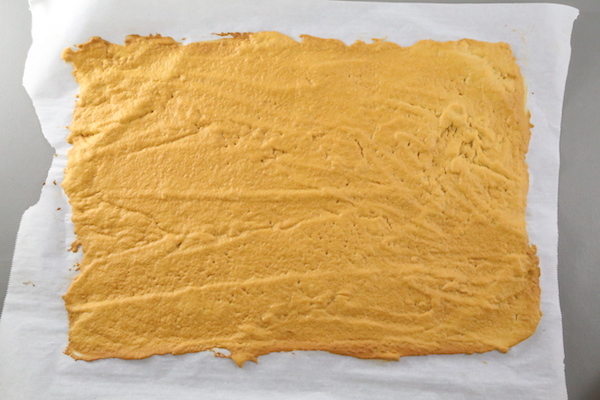 Pre-heat the oven to 350 degrees F. Cut out 4 pieces of parchment paper, overhanging an inverted 18" by 13" baking sheet. 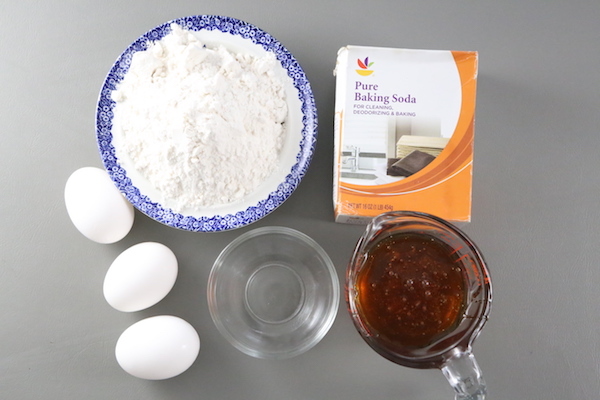 Dissolve the baking soda in vinegar and add to the egg mixture, along with the flour. Beat all together just until combined. 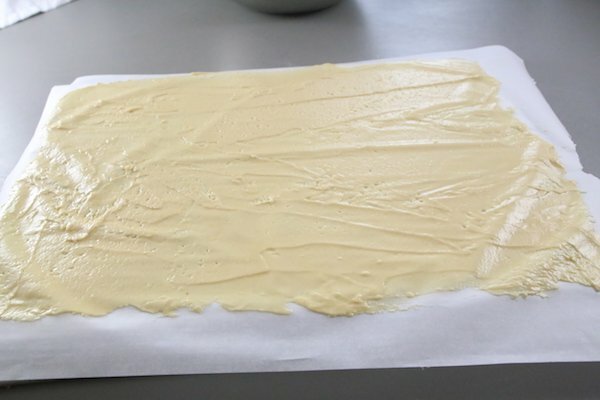 Place about 1/2 cup of batter onto an inverted baking sheet covered with parchment paper. Spread the mixture as thin as possible reaching the corners of the baking sheet and then bake for 7 minutes (batter should be spread out to the size of a 16" by 11-inch rectangle.) Repeat with remaining layers. 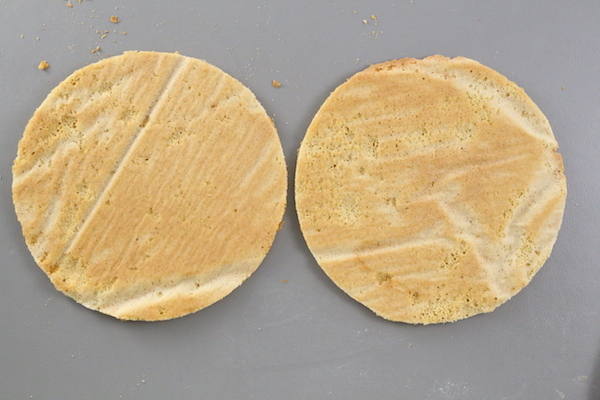 Carefully peel off the parchment paper and cut out 2 circles from each cake layer using a plate (about 7 1/2" in diameter.) You should have a total of 8 circles. 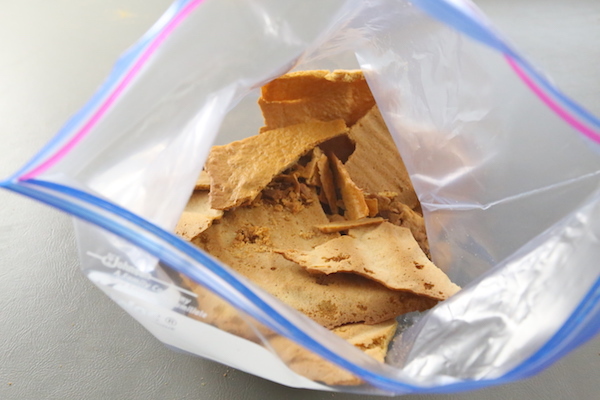 Place dried left-overs into a zip-lock bag and crush into fine crumbs using a rolling pin. 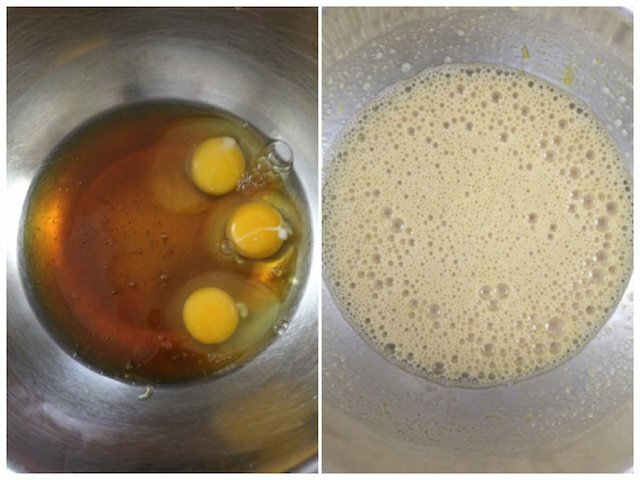 TO MAKE THE SYRUP: Whisk together 1/4 cup sugar and 1/2 cup hot water, until granules dissolve. Lightly brush each cake layer with the syrup. 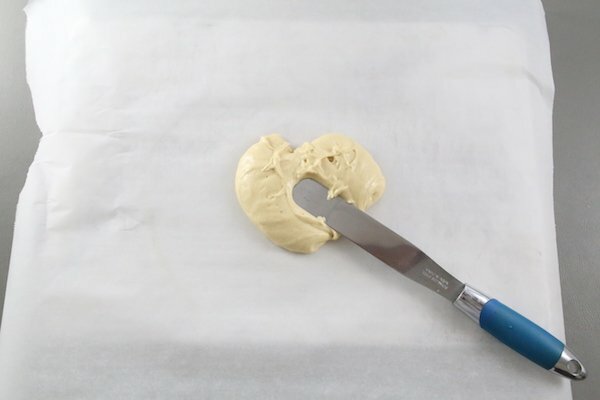 TO MAKE THE CREAM: Mix together the cool whip, sour cream, and condensed milk. TO ASSEMBLE THE CAKE: Place an inverted cake layer onto a cake plate. Spread some cream over each layer and then frost the sides and top. 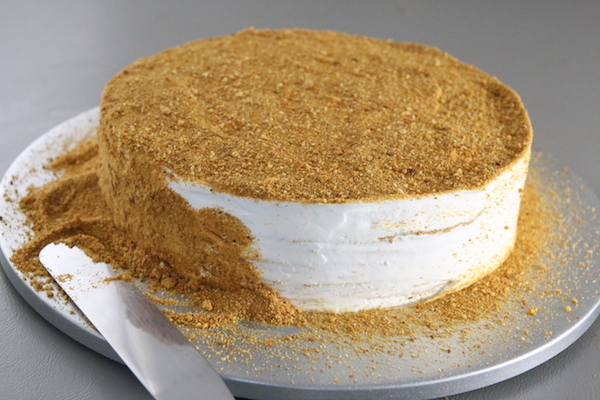 Generously dust the sides and top with the cake crumbs and refrigerate overnight. I really want to try this recipe, it sounds amazing! I don’t have the honey listed for use in this recipe, I only have the U.S. Grade A honey purchased from my grocery store, normally I try to buy local raw honey but couldn’t. Can I substitute this? Hi Barbara, as long as it’s smooth and runny, I think it should work. It’s the thick sugary honey that may be cause the batter to be too thick to work with but even that can be heated so either is possible. Does this cake have to be refrigerated between uses or can it stay out on the countertop for a couple of days? Just thinking if it’s safe to leave out then eat, with the cream in it. Thanks! I think room temperature would be fine for a day then I would keep it refrigerated. Is there any substitute to eggs in the recipe? Hi Ange, Yes you can use whipped cream along with some sugar to substitute for the cool whip. Try maybe a cup with 2 tbsp of sugar and you can always double that if it’s not enough. Came across this recipe and it seems interesting and easy. I just wanted to know if you can substitute condensed milk , in the filling, with honey? Hi Anu, You can probably leave out the condensed milk completely since it only calls for 2 TBSPS. I’m not so sure about the honey substitute that could possibly overdo the honey flavor in general but feel free to experiment to taste. Nice! Thank you for sharing, Alla! I used natural organic raw honey and had to add a lot more flour to get the dough thicker. It was also hard to rub the dought thinly on the paper. Maybe my dough wasnt thin enough for some layers, but i also had to cook some longer then 7 min due to center not cooking all the way. Overall it did end up taisting good and since you dont add sugar to the cream it wasn’t too overwhelmingly sweet.